The new line of Speedo competitive swimwear gives women greater comfort. For women, Speedo has created the new LZR Elite 2 Open Back competitive swimwear with comfort straps. This new swim team suit is ideal for women who are looking for greater coverage and want to try one of the newest styles. The changes this swimsuit brings provides female swimmers with additional support and the comfort they need to become better swimmers in the water. The beauty of choosing the LZR Elite 2 Open Back Suit with Comfort Straps is the increased comfort you will enjoy. This competitive swimwear used to give women many advantages in the water, but the straps were not the most comfortable to wear for a longer period of time. With the new design, swimmers are able to wear this swimsuit more comfortably so they can enjoy swimming even more than ever before. These straps are similar to those that are found on the Recordbreaker Pulse Knee Skin, giving women more options with the comfortable straps. The LZR Elite 2 Open Back Suit is made from the incredible Pulse fabric that is designed to offer female swimmers with even greater advantages in the water. This fabric is 40 percent more water repellant than many of the other materials that are used in competitive swimwear. The swimwear also features welded seams, rather than sewn seams, which can improve the drag by as much as six percent. Even with the open back, this swimwear offers more coverage, greater core stability and the right level of compression without weighing down the swimwear. The new LZR Elite 2 Open Back Suit is available as of November 25, 2013, giving swimmers a great option for the upcoming swim season. This competitive swimwear is FINA approved and is available in four great colors that mirror the new men’s jammer. These colors include black, black/sapphire, black/red and navy/light blue. This gives women many options that will match their team colors or allow them to express a sense of style in their swim team suits. When you are shopping for women’s competitive swimwear, you need to find options that provide the coverage and other features you need to swim more effectively. Speedo is one of the leading names in the swim industry, making them a brand you can trust. With their new LZR Elite 2 Open Back Suit with Comfort Straps, you will be able to enjoy all the benefits of the previous version with the addition of greater comfort. If you are looking for this new competitive swimwear, contact us to place your order. The Speedo Rapid Splice is the top swim team suit of 2012. Each year, the top names in competitive swimwear introduce new swimsuits that are meant to outshine the suits of the previous year. As the year wears on, some of the new swimsuits clearly begin to outshine the others in popularity and performance. For 2012, the best swim team suits that have risen above the rest of the field was the Speedo Rapid Splice suit for both men and women, providing swimmers with the competitive edge in the water. For the women, the Speedo Rapid Splice Energy Back proved to be the best swim team suit of 2012. This suit was designed in Xtra Life Lycra Fiber that provides the best fit over a longer period of time. The suit features thin straps for the least resistance in the water, as well as the perfect support and freedom of motion while you swim. The fabric from which the suit is made offers more than just the perfect fit over the long-term. It is also resistant to deterioration and holds its shape for much longer than Spandex. The Xtra Life Lycra Fiber is also resistant to sunscreen, chlorine and perspiration, which means you won’t need to buy a new one too quickly. It is available in seven colors. The Speedo Rapid Splice Jammer is the male version of this high-quality, top swim team suit of 2012. Like the women’s version, the men’s jammer is made from the Xtra Life Lycra Fabric, making it a long-lasting suit that will hold its shape and won’t wear down too quickly. This makes it one of the most effective competitive swimsuits for men that will allow you freedom of motion in the water. When your swimsuit isn’t holding you back, it is allowing you to move forward and perform better than ever. The men’s Speedo Rapid Splice is available in eight color combinations. Being the best swimsuit of the year requires a piece of swimwear to hold up under the harsh conditions of training and competitive swimming. For 2012, the swimsuit that came out on top is the Speedo Rapid Splice, available in the women’s Energy Back and the men’s Jammer. This suit is available in a wide range of colors, allowing swim teams to choose just the right color to create a uniform look for the entire team. See for yourself what makes the Speedo Rapid Splice such a great swim team suit. Swim team suits provide your swim team with a uniform look. Choosing swim suits for your swim team can be a tedious process. You want to make sure you choose swim suits that every member of your team will love wearing, as well as a suit that will provide the support and streamlined fit to ensure optimum speed when cutting through the water. You will be able to purchase these team summer swim suits to reflect your team’s colors so your team stands out from the rest of the teams in the pool at a price your team can afford. Speedo is one of the most well-known names when it comes to swim gear. The Speedo Rhythm Ripple Super Pro Back swim team suits come in a range of colors that will give your team the ability to choose the one that best suits them. These suits are made from 80 percent nylon and 20 percent Xtra Life Lycra, giving the suit longevity despite its extended exposure to the chlorine in the pools. Men can experience the same benefits with the jammer version of this swim team suit. 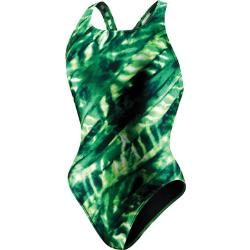 Another great choice for a summer swim team suit is the TYR Atlantic Diamondback. This swimsuit is built with speed in mind so you can feel assured that your team won’t be left behind in the water. These suits are manufactured from 100 percent polyester that is engineered for longevity in the water. Your team won’t need to worry about replacing their suits too often, even though they spend a lot of time in the water between practices and events. For men, this suit is available in a jammer or boxer. If your swim team is looking for a low cost option for your swim team suits, Dolfin provides several options, including the Spyda, Fractal and Chloroban. Each of these suits provides swimmers with the benefit of a choice of colors and a fit that will provide fast swimming in the water. The Spyda and Chloroban suits are made from 100 percent polyester and are chlorine resistant. The Fractal features 80 percent nylon and 20 percent spandex. Men can choose from racers or jammers in the Dolfin swim team suits. When you are selecting the swim team suits for your swim team, you want to find the lowest price without sacrificing the quality of the suit. Whether you choose the Speedo, TYR or Dolfin suits, you can count on a suit that fits well, looks good and will hold up to the chlorine in the water through all your practices and swim events. Can you mix electricity with water? You have always been told to not mix electricity and water together. Especially when you are at the pool and there are storms in the area. However TYR has a new swimsuit called the Nero and this may be the only time you can mix electricity with water. Especially when your team is wearing the latest addition to the TYR family. Nero’s vibrant streams of light seem to strobe, stir and pulsate with brilliance. This new swimsuit is a unique print with bright colors and will look great on any swimmer. Available in the Splice Jammer and Splice Racer, as well as the Maxback female swimsuit, which is TYR’s most supportive competition back. The entire collection is made of Lycra and are fully lined.